Israeli police forces banned a Mother’s Day ceremony, organized by the Jerusalem Girls Association, from taking place in the central occupied West Bank city of Jerusalem, on Thursday. 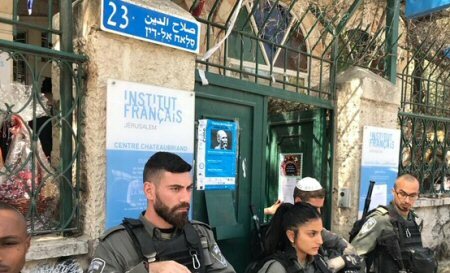 Local Ma’an sources said that Israeli forces stormed Institut Francais de Jerusalem, where the ceremony was set to take place, and forced individuals present in the building to evacuate, under the pretext that it was sponsored by the Palestinian Authority (PA). Sources mentioned that Israeli forces hung up the ban decision, signed by Israeli Public Security Minister Gilad Erdan, on the entrance of the building.